As deer hunting enthusiasts, it is easy for us to become stuck in only thinking about the hunt. Many of us will spend countless hours daydreaming about sitting in our favorite deer stand or blind, watching one of our hit list whitetails appear in view. While that is certainly the more attractive aspect of deer hunting, having that dream actually turn into a reality is an entirely different story. Much like any sport, success in the deer woods is often predicated on the amount of work you put into being prepared. Ensuring that your gear and equipment is ready to go is one thing, but ensuring that your property is ready in quite another. This summer’s preparation should have you pondering what can be done in terms of property management. This year making edges a priority through edge feathering strategies, might just be your ticket to success this year! Deer management is starting to evolve well beyond the thought that all you need to be successful is a couple of food plots here and there. Rather, sportsmen and women are beginning to see deer management in much broader sense, and understanding how they can address the nutritional and habitat requirements of white-tailed deer throughout the year and through this approach, have been able to hold more deer and grow larger deer than ever before. Deer management is all about taking advantage of what you have to work with, and maximizing it to the fullest extent possible, and deploying management practices such as edge feathering certainly checks that box. Before we dive right into the practice of edge feathering, it is important to understand what exactly constitutes and “edge” and why they are important to white-tailed deer and deer hunting. Edge Habitat – White-tailed deer, along with many other wildlife species are often classified as “edge” species. So what does “edge” species really mean? It means that white-tailed deer will seek out and utilize transitional areas between certain habitat types as travel areas and safety zones. If you stop and think about it, chances are that most of your deer stand locations are centered on these types of areas. Areas like crop field edges, or a transitional area within the timber such as where a creek bottom and ridge come together. These are all considered edge habitats, and when it comes to deer hunting and putting a mature whitetail on the ground, is certainly something that you cannot have enough of. Edge habitats can generally be broken down into two main categories, “Hard Edge” and “Soft Edge”. Hard edges are just like they sound, it is typically classified by an abrupt change from one habitat type to another. A great example of this would be where a CRP field or hay field falls right next to a crop field or woodlot, with no transitional area separating the two. Hard edges are all too common in today’s landscape and are generally not as beneficial for wildlife such as white-tailed deer. The natural world, hard edges are very uncommon. Mother Nature prefers to gradually change between habitat types, which is why having a soft edge can be far more beneficial when it comes to deer hunting and your overall management strategy. Soft edges are the exact opposite of hard edges. Soft edges are the transitional areas between habitat types and are widely favored by a wide array of wildlife species. Soft edges not only provide safety and cover, but they often provide an abundance of forage in the form of green browse and mast for wildlife to forage on throughout the year. Utilizing a practice like edge feathering to help increase your soft edge habitat can be one of the easiest was to increase the amount of forage and cover on your property with very little effort. Deer management often comes down to economics. Most deer hunters have the best of intentions and will do all they can to help provide as much habitat on their property as possible. At the end of the day, however, when the money runs out the management stops. 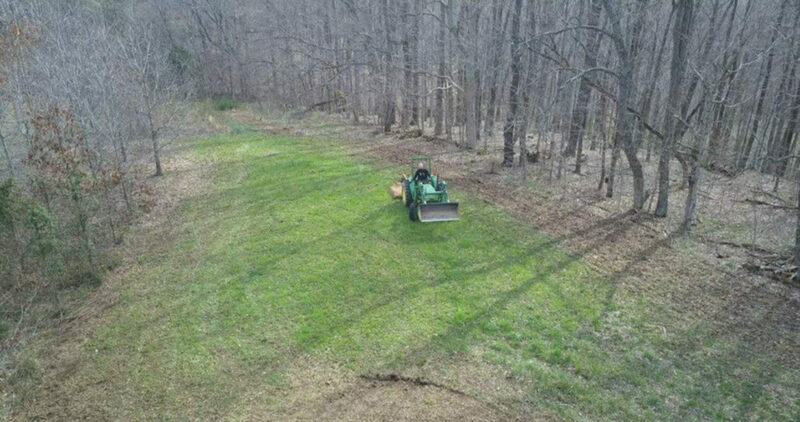 Within the list of deer management practices that someone can complete on their property, edge feathering is one of the most economical by far. In order to complete this practice all you really need is a chainsaw, some fuel, a pair of chainsaw chaps, a helmet, some work gloves, safety glasses and some stump killing herbicide (In some cases, depending upon your management objectives you may elect not to utilize the herbicide, although it is generally recommended) most of which, many deer hunters are likely to already possess. Before you declare a Jihad on all trees, it is important to go into your edge feathering project with your areas already identified. Some excellent areas to key in on area the woodlot edges, especially in areas where the wood lots meet open grassland habitats such as CRP fields. In and around your existing food plots area also excellent locations to implement your edge feathering practices as well. Additionally, wood draws or fingers that fall out into the interior of a field can also be excellent locations to complete your edge feathering project. When it comes to edge feathering, the goal is really quite simple. As we have already covered, the first objective or goal is to create a transitional area between habitat types, but in addition you hoping to allow the sunlight to reach bare mineral soil, which will stimulate the germination of native grasses, forbs and shrubs which will provide forage and nutrition for white-tailed deer and other wildlife. Also, by felling the trees loosely, you are hoping to create bedding and escape cover for adult white-tailed deer and fawns, as well as many other wildlife species. First and foremost, edge feathering is not hinge-cutting. Edge feathering involves felling the tree completely to the ground. Many deer hunters will mistake this concept, and the results will not be as beneficial. There are two methods for deploying the edge feathering practice. This first is what is referred to as linear edge feathering. Linear edge feathering can be conducted on wooded draws and fingers as well as woodlot edges. With the wooded draw scenario, most habitat managers would recommend felling most trees within the draw or finger, electing to leave any mast producing trees or deer stand locations. In the woodlot scenario, the objective should be to fell every tree at 30ft back from the edge and continue along the length of the wood lot. Stumps should be treated within both scenarios unless your objective is to greatly increase woody cover. Trees should be felled and stacking loosely (a good rule of thumb is if a volleyball can fall through the top of the tree pile and still reach the ground, it is suitable). Felling the trees too tightly only helps to create dens for predators. The benefits of edge feathering are often realized almost immediately and certainly within the first growing season. Although you can complete edge feathering at any time during the year, the best time would be following the completion of deer season during the colder part of the year. In addition to providing an excellent source of cover and habitat, edge feathering can also be a great way to increase your trail camera surveillance. White-tailed deer will utilize trail camera locations for travel, to and from food and bedding locations. While this fact alone is advantageous, edge feathering can also be utilized to help funnel white-tailed deer too, and through specific locations allowing you, a means to increase your trail camera photo library. Leaving an opening in a strategic location such as next to a food source will certainly provide a white-tailed deer with an easy entrance and exit point, and is an excellent location for your trail camera set. Keep this as you begin your edge feathering project and you might just be surprised how fast your cards fills up!